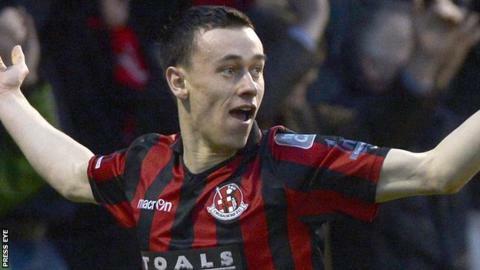 Newly-wed Paul Heatley is expected to return to the Crusaders team for Saturday's crucial north Belfast derby away to Cliftonville. The Crues winger missed Tuesday's 1-0 defeat at Portadown as he was getting married that day - but is available again for the Solitude showdown. Crusaders' lead at the top of the Irish Premiership is down to six points. But, with just four matches to go, they remain hot favourites to succeed Cliftonville as champions. Skipper Colin Coates missed Tuesday's game and is still suspended for Saturday's Solitude clash. The loss at Portadown was the first in 14 league fixtures for Stephen Baxter's Crues. "We had been on a great run since the first week of December. We lost one game on Tuesday night, but we have put ourselves in a great position and we need to push on," said the Crusaders manager. "The players are ready to go again. We have just got to prepare to play the opposition. If you win your games, the points will add up. "North Belfast derbies are always tough. I saw Cliftonville last Saturday and they were magnificent - then they were well beaten on Tuesday." Defending champions Cliftonville slipped out of title contention weeks ago, but manager Tommy Breslin wants to see some character from his side over their last three games of the season. The Reds crumbled to a remarkable 5-0 defeat away to Glenavon last time out and Breslin has demanded better. "It is all about character. They are a young bunch of lads but if they cannot respond to Tuesday's defeat, I am not sure they have a future in the game. "They need to put in a much better performance than they did at Mourneview. We were second best in every part of the pitch." Linfield, who revived their flagging championship hopes by beating Glentoran 2-1 on Tuesday, face Glenavon on Saturday. The match is being staged at Ballymena Showgrounds as Linfield's Windsor Park ground remains closed because of the damaged west stand. "Glenavon are on a great run, winning five on the bounce," said Linfield boss Warren Feeney. "I have told the lads to just go out and enjoy their football. Keep going until the end and see where it takes us. "It is still in Crusaders' hands - there is no pressure on us." At the bottom of the table, Institute will be relegated is they fail to beat Ballymena United at Drumahoe. Even if Paul Kee's side do win, it will be probably only be delaying the inevitable as the team with only four victories all season need to win their last three fixtures - and hope Warrenpoint lost their games - to have any hope of staying up.